Miles Away from being Magnificent. Eat up the glass from which you drink, Wow ! 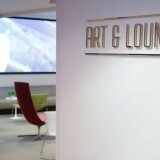 “Art and Lounge”: Lounge at Newark Liberty International Airport, New Jersey USA. Gladly accepts Priority Pass members and charge US$ 35 per pax. This lounge can easily qualify for one of the sloppiest lounges across the globe.Perhaps, was originally an art-lounge meant for displaying and promoting artistic works, Priority Pass and other prominent credit card promoters came along the way. The Wi Fi did not work during the three hours stay at the lounge. The Lounge attendants sounded helpless and unwilling to work on solving the Wi-Fi problem. Only few tables had access to the charging plug points. The wash room space barely enough for one person’s use at one time,certainly require upgrading and refurbishing.The interiors are simply good enough for an average waiting hall. The “All veggie healthy options” include a mini salad bar, a soup, a sandwich, some chips and peanuts.The alcoholic and non-alcoholic beverages offered are fairly functional though. 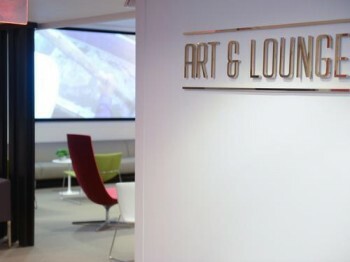 The ‘ Art and Lounge’ lacks all colours of the art of hospitality especially when it comes to service and assortment at this lounge. Not worth the value spent by Priority Pass members. 3D Printing: The Future is nigh! Copyright © 2019 Review International, All Rights Reserved. Legal Jurisdiction: All legal disputes will be settled in Dubai as per the law prevailing in UAE.